Fully revised and updated... Marco Polo maps feature completely up-to-date, digitally generated mapping. The high quality cartography with distance indicators and scale converters aid route planning. 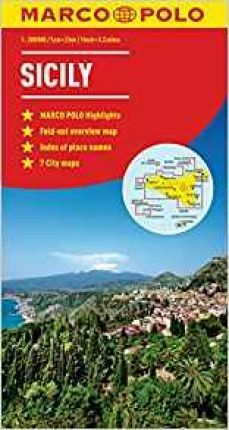 Includes 7 city maps: Catania, Cefalu, Enna, Messina, Palermo, Siracusa, Taormina. Major sights and key points of interest are marked on the map by numbered stars and these are listed in the index booklet with a brief description to help travellers pick the best places to see en route. Comprehensive index. The map scale is 1: 200 000.